Mike Woods was working at a running-shoes store in Ottawa, Canada when he began to borrow his dad’s bike. He was one of the best runners in the country, but he’d injured himself by overtraining. And so he had some time on his hands. He needed to do something. Anything. Riding, turns out, proved cathartic. And talent doesn’t just go away. Friends convinced him to try his hand at bike racing, and Woods soon discovered an innate talent. Local race wins earned him a spot on Canada’s national team for Tour de Beauce. His performance at Canada’s oldest stage race garnered him a UCI continental team contract two years after he first picked up a bike. Three years later, in 2016, Woods was pulling on argyle, making the leap up to the WorldTour. EF Education First Pro Cycling is thrilled to announce Woods has signed a multi-year extension with the team. Woods enjoyed a breakout season in 2018, finishing second at Liège-Bastogne-Liège, winning his first Grand Tour stage at the Vuelta a España and taking the bronze medal at the 2018 Road World Championships in Austria. It was after that Vuelta stage that more people would come to understand both Woods’ talent and his story: Woods publicly dedicated that emotional victory to a stillborn son, Hunter, he and wife Elly had lost two months prior. Woods was lovingly dubbed the “Rook” when he came onboard. He proved a quick study. “I came to the team not knowing who I was as a cyclist and what I was capable of,” Woods said. “I didn’t fit the typical neo-pro role. I’m lucky to have had the directors and team managers believe in me. Since joining the team in 2016, sport director Juanma Garate has worked closely with Woods. A latecomer to professional cycling, Woods played hockey growing up before finding success in running. He set the Canadian junior record in the mile (3:57:48) and the 3km (7:58:55). Both records still stand today. Woods earned a track scholarship to the University of Michigan, competed for the Canadian national team and harbored ambitions of becoming one of the world’s best milers. 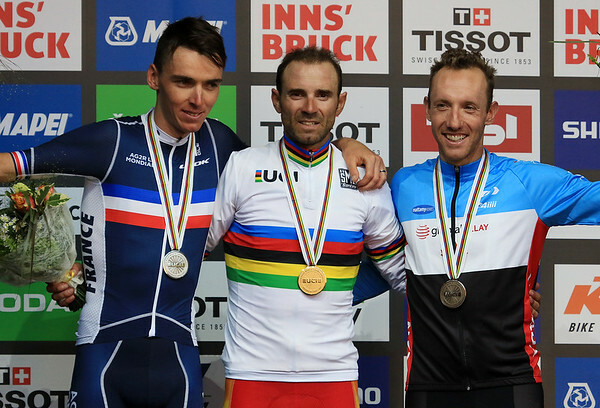 Running’s loss quickly became cycling’s gain. “I’m really pleased with the progression of the team since I joined it,” said Woods. “I had a lot of fun the first year, but it’s nothing compared to the kind of fun I’m having now. As an organization, the team is far more organized, far more focused, far more clear in its goals. I’m really proud to be a part of this team, especially now with the partnership with EF. Rigoberto Uran fractured his left clavicle on Monday during the second stage of Paris-Nice, from Les Bréviaires to Bellegarde, and was forced to abandon the race. The Colombian went down on his left side in the middle of a pack of riders midway through the stage, and he was immediately taken for evaluation at a nearby medical facility. 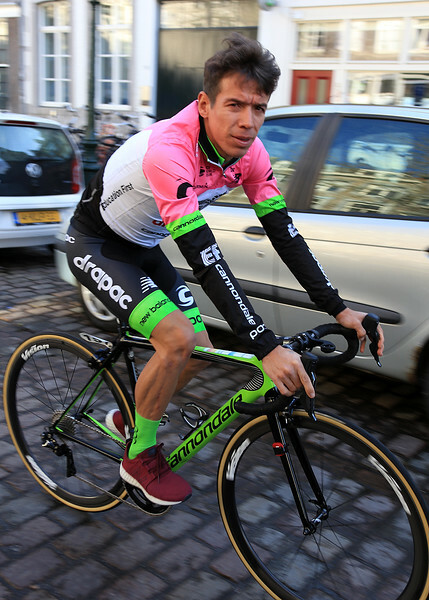 Dr. Jon Greenwall, team doctor at Paris-Nice, said that beyond the clavicle break and some road rash, there were no other concerns with Uran’s health. Specifically, he did not suffer a head injury. Uran is slated to travel to his European base of Monaco immediately and have surgery to repair the fracture Wednesday morning. Once the surgery is completed, Uran will be able to return to the trainer when he feels ready and will likely resume riding outside in a few weeks’ time. His return to racing will be carefully evaluated. Copyright © 2019 Slipstream Sports Inc., All rights reserved. Sep Vanmarcke won a small group sprint in Mandelieu-la-Napoul, France on Friday. The Belgian benefited from an adaptable team prepared to react to any scenario on the opening stage of Tour de Haut Var. With the stage win came the yellow race leader’s jersey. Groupama-FDJ showed their cards early, taking control of the pace-setting in the peloton behind the three-rider breakaway. The 154-kilometer stage offered up undulating terrain, and EF Education First Pro Cycling Team had discussed several different plans to approach the tricky route. With initial efforts thwarted, EF Education First regrouped ahead of the last climb. Only 20 riders remained in contention over the top, Vanmarcke and Hugh Carthy among them. Crashes and splits on the technical descent further reduced the group. Fourteen riders hit the four-kilometer flat run-in to the line. “Hugh knew Sep had a big chance to win the sprint, and immediately started riding in the front of the group to keep the pace high,” said Ken. 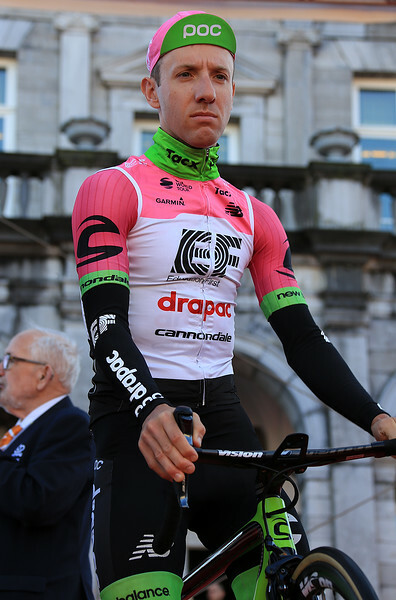 The younger Vanmarcke brother is EF Education First’s Classics captain. The Tour du Haut Var continues on Saturday with a hilly 200-kilometer day between Le Cannent-des-Maures and Mons. The Haut Var victory is the team’s fifth win in the still young season. Last year, the team recorded six victories in total. Dani Martinez stood on the Tour Colombia 2.1 podium atop Alto de las Palmas, Colombia on Sunday. The 22-year-old rode a bold race with the full support from his strong team, including his childhood hero Rigoberto Uran. The result? Third overall. Martinez, the newly crowned Colombian time trial champion, spearheaded EF Education First’s winning efforts during the team time trial. The result laid the foundation for the work that followed with Martinez riding a particularly gutsy race on stage five that put him only eight seconds out of the race lead. The energy Martinez expended on Saturday cost him in the closing kilometers on Sunday as the race was being decided up Las Palmas, the 15 kilometer summit finish. Uran proved stronger than Martinez but Garate had Uran hold back in the hopes of preserving Martinez’s overall podium position. 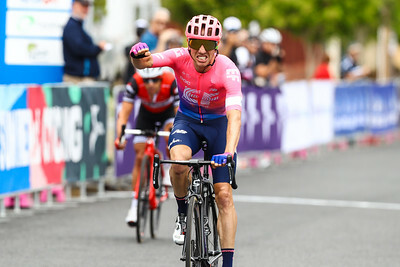 Uran and Martinez crossed the finish line side-by-side in fifth and sixth place, around a minute down on stage winner Nairo Quintana (Movistar). Mission accomplished. Martinez kept his podium spot. The young Colombian was joined on the podium by all his EF Education First teammates as they collected the team classification prize. Nearly nine thousand kilometers away and four hours before Martinez graced the podium, Simon Clarke collected awards and accolades of his own. The Australian, also tasked with a leadership role, rode a smart and strategic race at Tour de la Provence en route to second overall. EF Education First team management asked Clarke to arrive in France with the fitness required to contend for the general classification. He was happy to oblige. Clarke regularly rides in support of his teammates or in a road captain role. He embraced the opportunity to race as team leader, coming away with second overall, tied on time with race winner Gorka Izagirre (Astana). “I did a lot of preparation at home to make sure my condition was good coming into this race,” Clarke said. The stage race began with an opening stage time trial in Saintes-Maries-de-la-Mer. It was the only stage during the four-day race that Clarke finished outside the top five. After coming fourth on stages two and three, Clarke realized he had a real shot to stand on the top step of the podium in Aix-en-Provence on Sunday. Clarke began stage four in fourth overall, eight seconds off the race lead. He finished in second place on the stage and picked up enough bonus seconds to jump up to second overall. “I didn’t have high expectations today because the stage suited me the least of the road stages this week, but considering my position overall and the seconds on offer, we approached the day with same mentality as the other days,” said Clarke. “We took every opportunity possible. This actually worked out better than we expected. I picked up second in the intermediate sprint and second at the finish. EF Education First (EF), the world leader in international education, today announced that experienced sport and fitness executive Mary Wittenberg has joined EF as president of EF Pro Cycling. Wittenberg will help position the team for future success and promote EF’s mission of opening the world through education by encouraging people to step outside of their comfort zones and explore the world. Wittenberg recently served as the founding CEO of Virgin Sport and prior to that was the long time CEO of New York Road Runners and race director for the TCS New York City Marathon. Her experience in the running and endurance space spans 20 years, and her ability to think creatively in promoting athletes and partners dovetails with EF’s adventurous company spirit and bold goals for EF Pro Cycling in 2019 and beyond. Wittenberg will focus on creating fun new ways for the team and EF’s global workforce of 46,500 to interact, identifying new, compelling partnership opportunities, and exploring resources to further benefit the team. She will also liaise between EF senior leadership and EF Pro Cycling staff. In Wittenberg, team CEO, founder, and former pro cyclist Jonathan Vaughters has a partner who can help the team reach new audiences. The addition of Wittenberg comes as the team looks toward next season with a new perspective. EF Pro Cycling recently announced its partnership with apparel brand Rapha to collaborate on all-access content and bold new team kit, and the team will also put some of its riders in alternative-style events, from gravel races in the US to multi-day endurance races in far-flung locales. The aim? Reach more people, and tell more compelling stories. As the first female CEO of New York Road Runners and Race Director for the New York City Marathon, Wittenberg and her team drove unprecedented growth with initiatives that touched the five boroughs of New York, the nation, and the world. Wittenberg also co-founded the Abbott World Marathon Majors, a strategic alliance of the world’s major marathons of Boston, Chicago, New York, London, Berlin and Tokyo, created in 2006 to grow the sport of marathon running globally. Wittenberg’s start with the team is effective immediately. About EF Education First: EF Education First is an international education company that focuses on language, travel, academics and cultural exchange. Founded in 1965, EF has more than 580 offices and schools in over 50 countries. Moved by the powerful way cycling unites people of diverse backgrounds in a peaceful, fun, and friendly way to achieve extraordinary athletic feats, EF entered professional cycling in 2018 to help spread its mission of opening the world through education. Come 2019 Taylor Phinney will be crushing cobbles at the Spring Classics with EF Pro Cycling as he will return to the team next season. As Phinney eases into his off-season we chat about the drama of the Hell of the North, how the Tour de France is like playing Call of Duty, and superpowers. But if you talk to Italians or Belgians, Tour of Flanders is the be-all-and-end all and Paris-Roubaix is just an afterthought for whatever reason. But Paris-Roubaix is the jam and I think it’s sort of the last type of race that I can be good at. In this sport you see the trend of the races are changing and getting harder and hillier and more suited to smaller riders. So we kind of have these last races to hang onto to hope to do well at, for me that’s Paris-Roubaix. It’s the one race I do all year which I’m not at a weight disadvantage, because I just weigh a lot more than everybody else being 6 ft 5. You’ve extended with the team. How have you found riding for EF Pro Cycling this year? The team obviously want to win races and do well and that’s a priority, but there’s not this cookie cutter that you need to be a certain way or ride your bike a certain to be on the team, which you’ll find on a lot of other programmes. I think that it is the greatest thing ever. I mean when we were first hearing little rumours about the change and that Rapha wanted to come on board, it felt like all these different ideas that I had been talking about with friends, all these adventures I had been thinking about, it was like someone had read my mind. Copyright Â© 2018 Slipstream Sports Inc., All rights reserved. Joe Dombrowski has re-signed with EF Pro Cycling for the upcoming season. The American finished fifth overall at the 2018 Colorado Classic and sixth overall at the 2018 Tour of Utah. Dombrowski, 27, has raced four seasons in argyle following his move to the American-registered outfit from Team Sky, where he spent his neo-pro seasons. The team’s newly announced alternative race program appeals to Dombrowski, who is has been an occasional participant in non-road cycling events throughout his career. “My first focus is, of course, on the traditional road calendar, but the alternative race program is also quite interesting. I got my start racing mountain bike and cyclocross. I still jump in the odd cyclocross race in the off-season and in 2016 I raced Leadville with this team,” said Dombrowski. “Cycling’s fan base, particularly in America, is a participatory one. It’s not the same as the traditional American sports in that sense. Professional road cycling can be quite insular and convoluted. With a participatory fan base, watching races is not what creates a feeling of engagement in the sport. Like his teammates, Dombrowski has enjoyed the introduction of EF Education First into the team and the sport. Rapha was established in 2004 to address a need for stylish, high performance cycling clothing. It now provides products for every road cyclist and continues to push the boundaries of innovation in cyclewear. Alongside this, Rapha has cultivated a global community of passionate cyclists who come together as members of the Rapha Cycling Club (RCC), the largest club of its kind in the world. Rapha’s retail model and unique brand values come to life in its many rides and events and global network of Clubhouses that combine retail, a café and cycling culture under the same roof.